The Bakun dam was completed in 2011, thereby creating the Bakun lake, a large lake with an area of 695 km². It is located in central Sarawak on the Balui river, in a very remote area of Sarawak, 60km from Belaga and 50km from Sungai Asap. The dam was built primarily to generate electric power. Since an area of almost 700 km² was flooded, about 9000 native residents (mainly Kayan/Kenyah) had to be relocated. Many of them resettled in Sungai Asap, a small town in central Sarawak. The Bakun lake can be accessed by visitors without the need to obtain a permit. Essentially tourists either go to the lake with a tour or self-drive and register at the security gate. The Bakun lake has a lot of tourist potential because it is in a very remote area of Sarawak with virgin rainforest, and with a boat it is easily possible to access all parts of the lake. Best would to visit the lake with a houseboat offering accommodation and catering because parts of the lake are quite far away and at the lake there is no hotel. In fact there are houseboat tours for the Bakun lake. The Bakun lake doesn't seem to get many tourists, probably because of its remote location, far away from cities and airports in Sarawak, and the lack of tourist facilities. For comparison, the Kenyir lake in west Malaysia receives way more visitors because it is relatively close to Kuala Terengganu, and even the Batang Ai lake has much better tourist infrastructure (there is a Hilton hotel). 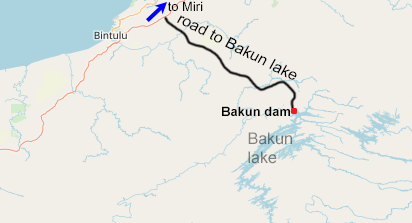 The Bakun dam and lake can be reached with a normal sedan car, since the road is completely paved. The last 100 km of the road however are in poor conditions, since the road surface has been damaged in several areas. Because there is no public transportation, it's necessary to either rent a car or go with a tour. From Miri it takes about four hours to reach the lake, from Bintulu probably less than 3. Near the jetty there is a big parking. At the moment there are no hotels at the Bakun lake or dam. The only option (to stay more than one day) is to book a tour with a houseboat with a tour operator.